When Alex first arrives at the drop-in computer class at his local neighbourhood house he’s never used a keyboard or surfed the Internet before. But he’s determined to learn so he can apply for government services he needs as a recently unemployed person with disabilities. 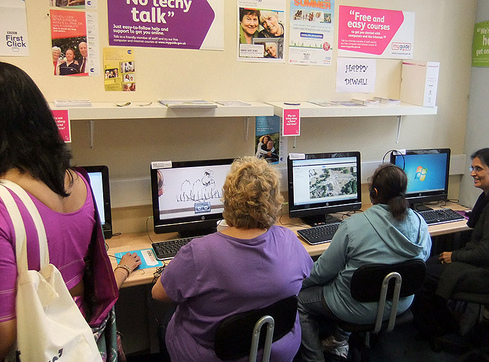 Alex attends the weekly drop-in classes faithfully, working with a volunteer tutor who patiently walks him through the complex process of applying for disability benefits online. Maggie[i] is another regular at the class. She was referred by a provincial employment office for help applying for jobs. Maggie has no Internet connection at home and needs hours of one-to-one support to use employers’ online job application systems. Sometimes she misses a response from an employer because she can’t get into her email account. These everyday experiences of digital access parallel those of many other low income Canadians who are being kept (or pushed) offline by unaffordable high-speed Internet fees, low speed targets and data capping, as well as cuts to adult and community literacy programs that were once hubs of digital learning. The irony is that amidst these struggles, the federal government has announced intentions to take ever more government services online. The complexities of access experienced by people like Alex and Maggie are lost in this Digital Canada 150 strategy, released in 2014, which narrowly defines digital access as the availability of an Internet connection (note that availability does not include affordability). The strategy relies on the hope that a competitive telecommunications market will result in competitive Internet rates and incentives to provide services to rural and remote communities. The digital policies of other federal parties are only slightly more ambitious. The NDP’s ‘bridging the digital divide’ calls for widespread availability of highspeed Internet and the auction of wireless spectrum, the invisible but limited airways that transmit data, to subsidize affordable Internet access for rural and remote communities. The Liberals are calling for improvements in the accessibility of government services and improved privacy and security. But all this is rather piecemeal. In other jurisdictions we find more comprehensive digital strategies that link local and federal policies based on 7 principles of access: availability, affordability, design and use-ability, public access, relevance, digital literacy and consumer safety. These principles form a comprehensive digital inclusion framework developed in 2010 by the ICMA, the Institute for Museum and Library Services and the Technology and Social Change Group at the University of Washington, with the understanding that a digital inclusion framework is as necessary for infrastructure development as is a transit, housing or economic development plan. When Alex moved to a cheaper apartment, he qualified for a 6-month ‘new Internet subscriber’ $30 monthly rate. A friend lent him a very old but functioning laptop computer and with support from the neighbourhood house tutors he got an email and Facebook account. Alex was connected! At least for a time. He read local and international news, reconnected with family and friends, practiced his writing and typing skills, learned about health issues and made medical appointments. But when he opened a spam email and his computer crashed he had nowhere to go for help, and he missed an email message to attend a long-awaited medical appointment. The lower Internet rate expired and Alex faced a $58 monthly bill he could not afford. He cut back in other areas of his small budget to keep his connection, as many other Canadians must do. Alex’s experience suggests that being ‘connected’ is not a one-off event. Digital access is an ongoing effort that requires a comprehensive vision and an integration of the seven principles of access, oriented to the needs of lower income, less-educated Canadians. A coalition of anti-poverty and advocacy groups are calling attention to this, arguing that the Internet is not a luxury but a right, and calling for the CRTC in its current consultation on basic communication services to subsidize Internet access for low income Canadians; President Obama just announced such a policy in the US. When federal parties put forward more developed digital strategies in the coming election season (and let’s hope they will!) they should take into account that these everyday digital exclusions affect our economy, and our social fabric too. How does Alex manage his health care if he can’t afford an Internet connection? How does Maggie find work if she does not know how to use the online job application systems and can’t afford a computer? Designing digital strategies that address these problems will take us further down the road to a connected Canada. Suzanne Smythe is an Assistant Professor in Adult Literacy/Adult Education in the Faculty of Education at Simon Fraser University and a Research Associate with the CCPA-BC. She researches and teaches in the areas of digital literacies, community-based adult learning and adult education policy. This article was first published on CCPA-BC’s blog, Policy Note. [i] Alex and Maggie are real people but these are not real names.